Interest only loans are used by a lot of investors in order to reduce their monthly cost in order to increase their tax deductions and in order to get the maximum return on investment for their property. All sounds pretty good don’t it? But are interest only loans good for positively geared investment property that’s exactly what we’re going to be covering in today’s episode. 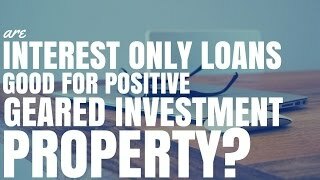 So interest only loans have this array of benefits that I am going to talk about in more detail, so let’s have a look at interest only loans and let’s compare them to principal and interest loans and say whether or not interest-only loans are good for positively geared investment properties? The first thing to understand is that interest only loans lower your monthly repayments significantly. With an interest on the loans you are only paying the interest on the mortgage and you are not paying down any of the principal or the amount that you actually owe, so what this means is because you’re not paying on top of the interest your loan amount stays the same but also means that you’re repayment are much less. let’s have a look at an example: a five hundred thousand dollar property being mortgage to you at five percent, (let’s just assume the full loan of five hundred thousand dollars) if you’re going interests only you’re going to be paying approximately four hundred and eighty dollars per week, alright that’s not too bad, four hundred eighty dollars per week. But now let’s have a look principal and interest if you were to go with the principal and interest loan and try and pay off that loan in twenty years your repayments would go from four hundred and eighty dollars to seven hundred and sixty dollars that is a two hundred and eighty dollars per week increase in your repayments. I don’t know about you but getting increased in your rental income of two hundred eighty dollars is not an easy thing to do. If we were to stretch out that loan and try and paid off in thirty years which is generally speaking the longest loan period that you would alt for your repayments go down to six hundred and twenty dollars but compared to the interest only loan that’s still one hundred and forty dollars more per week that you’re going to be paying in loan repayments. now obviously overtime this is going to pay off and eventually you’ll have no mortgage at all which will work in your favor but in the beginning which is when cash flow tends to be at its hottest going for principal and interest can totally blow out your cash flow and turn what could have been a positively geared property into a negatively geared property. Interest only loans can also help you maximize your tax deductions. Now I did a full episode on tax deductions and you can get the links to that by going to this page which is OnProperty.com.au/129 for episode one hundred twenty nine and a link up to all the deductions you can claim over there. But by going with interests only what it means is that you were not paying down your principal and therefore because the loan amount is staying the same and your interest repayments staying the same you can actually claim that as an expense. Now obviously this is for educational purposes only so to speak to you a tax accountant if you are going to go ahead and do this but basically if you are paying principal and interest overtime the amount of principle you are paying increases as the amount of interest you’re paying decreases. So even though you’re paying the same amount every single week or every single month the amount that you can actually claim is actually going down every single wake or every single month because you’re being charged less interest, so by saying interest-only and maybe funneling of that money to pay off something that’s not tax deductible like your credit card or your home loan you might be able to maximize your tax deductions. Again I need to put in the disk claimer to say that I’m not a tax advisor I’m not a financial advisor so seek professional help before you do anything related to tax. The last thing that you want is to have the tax man come and knock on your door and say you owe us fifty thousand dollars plus interest, so get a professional to talk to you. So by halting to stay interest only you could potentially improve your situation because you maximizing your tax deductions this could lead to a better tax refund or it could lead to a smaller tax bill when it comes time to do your tax. Interest only loans can still be offset and can still be paid down, so speak to your mortgage broker about your particular loan and you can get a list those mortgage brokers that I have interviewed or that I recommend by going to Onproperty.com.au/brokers. Basically there are a lot of loans out there that allow you to have what’s called an offset account and this means any money in that account offsets your loan. So if you have got two thousand dollars in that account then that’s two thousand dollars you’re not paying interest on while that money is sitting in that account. So there is the opportunity to have a interest only loan with an offset account so you can effectively lower the interest you have to pay by having money in that offset account without actually paying off any of your mortgage and obviously you can put money on top of the interest only in order to pay that down as well. Again speak to your mortgage broker or speak to your bank about how to do this and if there’s any fee associated with offset account or with paying more than what you expected to pay on your mortgage. One of the things that you need to think about when it comes to interest-only loans is that in order to grow your portfolio in order to gain equity you are now relying on capital growth or you’re relying on savings in order to build equity or to build a deposit to go forth and invest in the next property. When you are doing principal and interest you are paying down your loan amount so every time you pay off principle you are gaining that back in terms of equity it becomes equity in your property but if you are going interest-only then you are not gaining any equity by paying down debt, therefore you are reliant on capital gains so for that property to grow in value or you’re relying on creating your own savings account or offset account in order to build equity or to build that deposit. Now this isn’t necessarily bad having money in an offset account means that’s your money and you can take it out and use that when you want to where as if you paid off your loan you’re going to have to go and reapply for equity loan in order to go ahead and invest. So in many cases it can actually be beneficial to you this is a good thing to you to keep in mind and lastly as rental income grows often investors will convert their interest on the loans to principal and interest loans. A lot of interest only loans are limited to a short numbered of years three years, four years or maybe five years however after five years you may decide that now it’s time to go ahead and get a principal and interest loan. Maybe the rental income has gone up significantly over that five years and you can now afford to make those principal and interest repayments or maybe you just decide it’s time to start lowering your risk to pay down your debt, so over time if your rental income goes up you can always refinance and make the switch to go from interest only two principal and interest and that way hopefully eventually your mortgage will be completely paid off and you won’t have to worry about interest only or principal and interest because you won’t have a loan at all, isn’t that the dream to be rich to have all these properties to not have to end up to a bank and to have all that cash coming to us. So in conclusion interest only loans can be extremely beneficial because they’re lowering those amounts of money you have to pay each and every month in the beginning when cash flow is the tightest obviously you can change that at a later date if you want to, can also help you maximize your tax deductions and it can even be offset or paid down if you want to take that step and do it. So are interest only loans good for positively geared investor properties? I’m not a financial advisor so I can say a definitive yes because obviously it’s going to rely heavily on what your situation is but it is definitely something to consider a and definitely something to speak to your mortgage broker about. If you want the full transcription of this episode go to Onproperty.com.au/129 because this is episode one hundred and twenty nine and remember I have an extremely important announcement that I am making on the 31st of March on something that I am launching on the first of April, it’s going to be free it’s not going to be a paid product is going to be something that’s really exciting and something that’s free so check out the blog on the night of the 31st of March or on the morning of the first of April to see what we’re doing and I’m super excited about this I’ve being wanting to do it for a while but it’s been holding back because a lot of effort goes into these podcast episodes that I don’t necessarily have enough time to do it but now I’m getting quicker I’m getting better and So now it’s time to launch something new and to add even more value to your property search to your life so stay tuned that is coming down the pipeline. So until tomorrow remember that your long-term success is only achieved one day at a time.